January 22nd, Last week, Prime Minister Shinzo Abe pledged $200 million in non-military assistance to support countries affected by the campaign against ISIS during an ongoing six-day Middle East tour. Today (January 20th Japan time), The Islamic State released a video threatening to kill two Japanese hostages, the journalist Kenji Goto, and another self-proclaimed mercenary, unless they receive a $200 million ransom in the next 72 hours. The hawkish prime minister and his cabinet who have moved forward to remilitarize Japan under the guise of “collective self defense” are now in the difficult position of whether to negotiate with terrorists or to let two Japanese citizens be killed. Neither decision will have a happy outcome. For the rest of the story, see ISIS Pisses Off Pacifist Japan. Japan’s Ministry of Foreign Affairs (MOFA)ーー外務省ーー, also lovingly known as MOFO by the foreign and Japanese press for their frustrating non-response to questions, has released an official statement which is a masterpiece of obfuscation and strange English. What makes the announcement particulary surreal and disingenuous is that MOFA and the Japanese government have known that Kenji Goto was being held for a ransom of 10 million dollars since November of last year. The Japanese government did not tell this to the press or the public. Why? The reasons are unclear. Here is the statement. Italics added for sarcastic purposes. For the latest late disinformation, in nearly incomprehensibly English, stay tuned to the MOFA Facebook page. 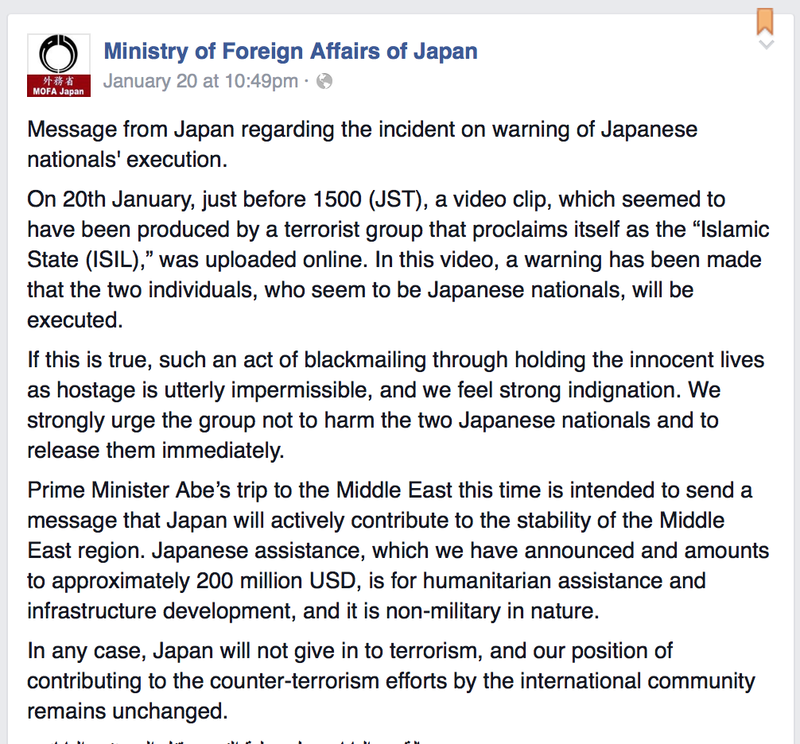 Message from Japan regarding the incident on warning of Japanese nationals’ execution. On 20th January, just before 1500 (JST), a video clip, which seemed to have been produced by a terrorist group that proclaims itself as the “Islamic State (ISIL),” was uploaded online. In this video, a warning has been made that the two individuals, who seem to be Japanese nationals, will be executed. If this is true, such an act of blackmailing through holding the innocent lives as hostage is utterly impermissible, and we feel strong indignation. We strongly urge the group not to harm the two Japanese nationals and to release them immediately. Prime Minister Abe’s trip to the Middle East this time is intended to send a message that Japan will actively contribute to the stability of the Middle East region. Japanese assistance, which we have announced and amounts to approximately 200 million USD, is for humanitarian assistance and infrastructure development, and it is non-military in nature. In any case, Japan will not give in to terrorism, and our position of contributing to the counter-terrorism efforts by the international community remains unchanged. قبل الساعة الثالثة بعد الظهر اليوم (يوم 20 يناير) بالتوقيت الياباني، تم نشر صورة متحركة يبدو أنها بُثت من قبل التنظيم الإرهابي الذي يسمي نفسه بـ”الدولة الإسلامية” عبر الإنترنت. وفي هذه الصورة رهينتان يبدو أنهما يابانيان يهدد هذا التنظيم الإرهابي بقتلهما. إذا كان هذا هو الواقع، فإننا نشعر بغضب شديد ولن نتسامح أبدا مع مثل هذه العملية للتهديد مع خطف حياة الناس. فنطلب بقوة عدم تعريض هذين اليابانيين للخطر وإطلاق سراحهما فورا. إن هدف زيارة رئيس الوزراء الياباني شينزو آبي إلى الشرق الأوسط ليس سوى أن يعلن أن اليابان مصممة على المساهمة بصورة بناءة في تحقيق استقرار الشرق الأوسط، كما أن مساعدات الـ200 مليون دولار التي أعلنتها اليابان سيتم تقديمها في المجالات غير العسكرية بما في ذلك المساعدات الإنسانية والبنى التحتية. وعلى أي حال، فإن موقف اليابان سيظل دون تغير حيث إن اليابان تواصل مساهمتها في مكافحة الإرهاب التي يقودها المجتمع الدولي، ولن تخضع للإرهاب. The Ministry of Foreign Affair officially explains the hypothetical seeming hostage situation which is if true and threat carried out, will result in strong indignation! Take that ISIS.